In one mirror I look like an old man, an ancient drooler if you want the truth; one pinch beneath the fur gives the lie to this, unless I've found the one patch of skin on my near-carcass that doesn't sag above muscles gone permanently feeble. 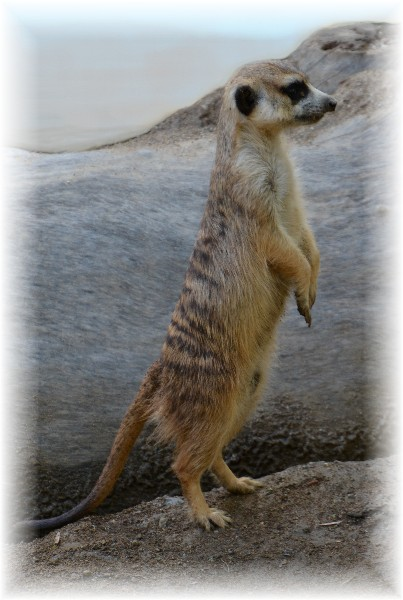 In another I look like a meercat alertly perched on its hind legs, stretched to full height, peering about happily; I could swear I have more body than that, and if I touch around the eye sockets, they don't seem to protrude nearly so much out of my face, but how can I know with certainty? In a third my horn is being methodically sawed off by men eager for the gold to be gained by grinding it down to a fine powder famed for its remedicinal and aphrodisiac properties (I, tethered by hemp corded thick as cable, with chains for good measure, am unable to resist). Though I can see no-one about me, I begin to feel rough hands, eager, an unbearable pain in my forehead simultaneous with a gushing stream that ought to blind me but instead stripes my vision with red barlike streaks. I can only make out shapes, a figure wrapped in fur, a prodigious heaving bosom, less than that and progressively less in a series of receding mirrors which might just possibly multiply without end. In the near distance I can make out lights and colours as bright as a sitcom set, and the further they recede the more vividly and ecstatically they shimmer; the gap closes in my forehead; perhaps I'm happy in those reflections and considering the number of them, possibly I'm ahead on the percentages. In one mirror I'm an old crone with an apple and a pocket reflector; in another I'm wondering why I'm trying so hard to win a tennis match when I should be losing at speed in order to pursue a murderer who's trying to frame me for his crimes; in a third I wear my rue with a difference. A long succession of mirrors recede. . .